ASP.NET has made it really easy for developers to quickly develop a functional website. In this tutorial we will develop a basic website using C#. The website will have functionalities like user registration and administration etc. Users will be able to upload pictures to their profiles and will be able to edit their profiles. To enjoy all these features a user should first register to the website. 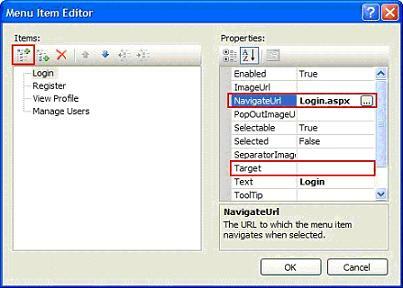 Also, there is User Management web application, used in this tutorial. I also added "unique constraint" to the column "User_Name", so that user name is never duplicated. 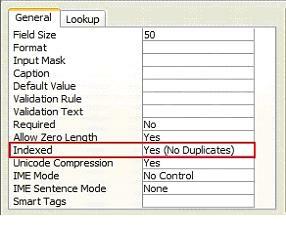 To add this constraint first select the desired column, in the general tab select Indexed attribute as "Yes (No Duplicates)". For connecting to a database you need to include the namespace System.Data.OleDb at start of the file. Double click the Login button to write the code for login process. First of all get the database connection string from the web.config file. Now we will open the connection and fill our dataset. A data set is a disconnected array of records that is filled by using a data adapter. Data adapter acts as a bridge between our data set and the actual database. If you need to read from the database again you just have to access the data set. In ASP.NET the Session object is of global nature and can be assessed and manipulated by programmer on any webpage. After successful login you can redirect user to another page using Response.Redirect("Desired_Page.aspx") or you can display some welcome message. We will now move towards registering different user accounts. To register a user, create a page for registration. I placed all the controls inside a table control. That's made the whole process lot easier. 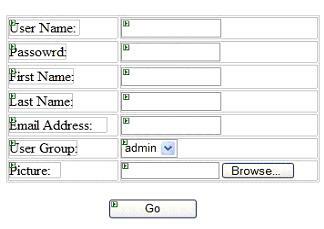 The table control is available under HTML section in the Toolbox. I placed different controls as shown in the diagram. On the Click event of Go button, get connection information from the web.config and create a connection object as described in the Login process. To execute a command you need to create an object belonging to the OleDbCommand class. MyCmd is your string for the insert query. The query will get composed on the fly based on the arguments provided by user. FileStream class available in ASP.NET can be used for asynchronous and synchronous file read and write operations. Its Write function takes three parameters. First one (MyFileBuffer) is the buffer containing the data to be saved. The second parameter is byte offset in array which is zero in our scenario. Third parameter is size of the buffer. To display image in an ASP.NET application you need to set content type as image/gif. Now we will move towards the user management part of this tutorial. First of all create a separate webpage and place a data grid control from the Toolbox. This data grid will show us the complete list of users. On the page load event we just need to execute select command and fill a dataset. After filling a dataset, say "ds", using adapter we need to bind that dataset with our data grid control. After the query string you just need to use the command object to execute the command. Click the link "Edit Menu Items..." This will display a dialogue box in which you can add menu items in a hierarchical fashion. Add items one by one by clicking a plus button at the top left corner of the dialogue box. You also need to specify the NavigateURL property. Just browse your target file you want this item to point to. Leave the Target property blank if you want to open the target page in the same window. After you are done click the OK button. ASP.NET also allows you to choose different predefined menu layouts. 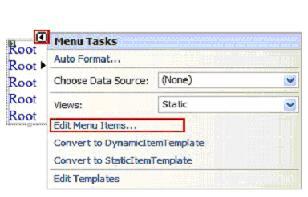 For this purpose you need to click the Auto Format link available on the menu task dialogue box. You can copy paste same menu control on other pages if desired. 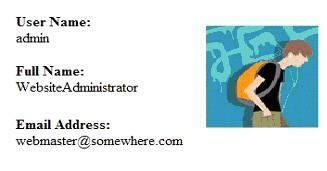 Similarly in the manage users page, add similar code to prevent anonymous or unauthorized access.